With the help of the Morae Add-In for Word, you can use a study configuration to create paper handouts for your sessions. 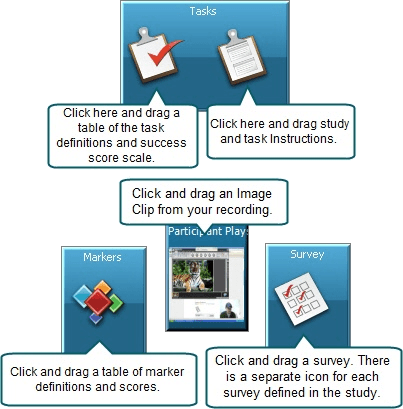 In Recorder, create a study configuration, making sure to enter the Study Instructions and Task Instructions, along with any surveys, in the Study Details dialog box. Open Microsoft Word and the Morae Task Pane. In Word 2007 and 2010, by default, the Morae Task Pane opens with Word. Open or close the Morae Task Pane with the check box in Add-Ins tab > TechSmith Morae group. In the Morae Task Pane, browse to locate the saved study configuration file (.mrcfg). All available study components open in the Morae Task Pane. Click and drag the instructions and surveys to the open Word file. Add page breaks and text formatting, as needed. Save and print the handouts.